Outdoor patio furniture can be a real problem when it comes to mildew build-up and removing tough mold stains. 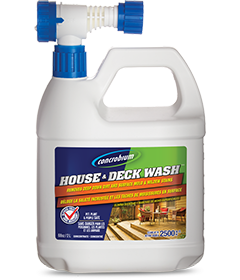 Stay away from any bleach based products and use Concrobium to effectively clean away mold and mildew without discolouring the surfaces of your patio furniture. 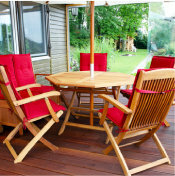 Concrobium works effectively on plastic, wood, wicker, and metal furniture to keep your patio set mold free. Using a spray bottle or garden sprayer, apply a thin, even application of Concrobium Mold Control to the moldy surface. Allow to dry completely as Concrobium Mold Control kills the existing mold spores as it dries. 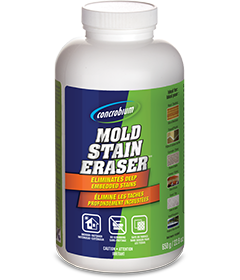 Clean the moldy surface with a Concrobium dampened cloth or for deep embedded or black mold staining, try Concrobium Mold Stain Eraser. For outdoor furniture that receives frequent exposure to the elements, apply Concrobium Mold Defense every 1-2 months or as needed to ensure a protective mold barrier remains intact. After a rainstorm, be sure to remove any accumulated water in outdoor furniture and wipe down the remaining moisture. This will help to control the breeding environment for mold and prevent future growth.